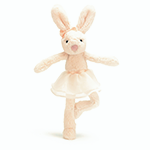 Jellycat Tutu Lulu Bunny loves ballet so much, she always wants to wear her tutu! With scrummy vanilla fur and a ribbon on her ear, she’s ready to get on stage and wow the crowd. And she doesn’t even need satin shoes - she prefers to go barepaw for every show!